This looks like a pretty pleasant weekend. Dry, as usual, and with high temperatures around 60 F each day. Nothing like last Sunday's bitter blowout! Friday will have winds from the west/southwest, moderate to strong over most of the area, but lighter in Alamogordo. Saturday, over most of the area it will be east and northeast, moderate in the morning and getting fairly light in the afternoon. In Alamogordo, though, it should be light southwest to west. On Sunday, much like Saturday, but more easterly some places, and light northwest in Alamogordo. It looks to me like Dry Canyon will work well on Friday. It looks too westerly to make Mag Rim a good place to fly, but Agave Hill and Nelson's Launch in El Paso might be good for PG's. The Little Floridas look like a blowout on Friday. On Saturday Volcanic Peak, west of Las Cruces, looks pretty good early on, before it gets light in the afternoon. The Little Floridas won't work in those east winds, and it doesn't look good for the El Paso sites. Dry Canyon should work, though, and might be pretty good for PG's since the winds will be light. On Sunday I would recommend the La Luz NW launch, another try at Volcanic Peak (looks steady NE, about 7-10 mph) and possibly some PG soaring at Anapra, if it gets easterly enough. I don't expect great soaring this weekend, since winds are so light, but it should definitely be launchable all around the area. Towing at the Sod Farms should be fine, all three days. Enjoy! I may be guiding some out of town pilots (I can't fly until my chute gets back from repack) and anyone who wants to join us is welcome. Be safe! We could use some rain, but at least the weather's good for flying. Another warm, dry weekend is in store for us. Friday winds should be light to moderate southwest. Saturday, stronger winds from the west in El Paso and Las Cruces, but out of the northwest in Alamogordo, and not too strong. Sunday, winds are much lighter, out of the west, except Alamogordo where they should be the same as on Saturday. My take on the flying possibilities: Friday, you should have good flights at Magdalena Rim, Dry Canyon, La Luz, Nelson's Launch and Agave Hill. On Saturday, your best bet is probably La Luz. It's possible that Kilbourne Hole might be good, too. Sunday, I expect La Luz, Agave Hill and Nelson's Launch to work OK. I expect the towing at the Sod Farms to be good all weekend. I'll be unavailable on the weekend, but Friday would work if someone wants to go to Magdalena Rim. (And if I can get a parachute...) Keep in touch about it! And fly safely. Kilbourne Hole? Was this named after hang gliding pioneer Dave Kilbourne? If so, what is the history of this naming? I don't know who Kilbourne Hole is named after. It's been known about for a very long time, so it probably predates hang gliding by quite a lot. (And as far as I know, I'm the first guy to fly a hang glider into it.) It's a nice place to do a short flight, but retrieval is very difficult. PG pilots fly it, though, and sometimes soar, and if they land in the bottom they can hike back out. If you search the U.S. Hawks forum for "Kilbourne" with the author set to "JoeF", you'll find some exploration of the naming. Bob, I couldn't find the one you were referring to. Frank Colver wrote: Bob, I couldn't find the one you were referring to. So, after following the link and reading all of the postings I conclude that no one brought forward any evidence that the name Kilbourne Hole has any connection with hang gliding pioneer Dave Kilbourne. Interesting coincidence that a place bearing that name would become a hang gliding site. I doubt that Dave would have even known of its existence. 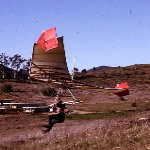 I've attached a photo of Dave flying my Eipper FlexiFloater at the 10th anniversary of modern sport hang gliding held at Torrey Pines in 1981. All of the pilots who started flying HG's after the era of the "standard Rogollo" were amazed at how light my glider was when they picked it up. IT was a poor flying day at Torrey that day but Dave managed to make three long passes wile other gliders were barely sustaining near cliff height. This is a good/bad weekend for flying. It'll be warm and dry, until it gets cool and dry on Sunday. It'll have light to moderate winds, except for the blowout on Saturday. (And the Little Floridas look like a blowout all weekend, so don't hold out any hopes for that site.) On Friday the winds are probably too westerly for Magdalena Rim near Las Cruces, but Dry Canyon, La Luz, Agave Hill and Nelson's Launch might be good. On Saturday, I wouldn't bother setting up - I expect blown out conditions all day long. (Maybe some early training hill flights could work.) The Saturday conditions presage cooler weather; the high temperatures will be in the 50's F (instead of the 60's and 70's we've been having) on Sunday - but at least the winds will be calmer, out of the south and southwest, light to moderate. Magdalena Rim, Dry Canyon and La Luz should be good; I expect too much south and southeast to make Nelson's Launch and Agave Hill worth a trip. If someone wants a Friday flight, let me know! I have my parachute back. And so far, the Guadalupes over Presidents Day Weekend (about 10 days from now) don't look too bad - I'll post some updates as I find out more. Be safe this weekend! The good news is that we're getting rain! The bad news is, we're getting rain - and wind. It's a complicated forecast, this time around. For the local area, it looks like we get rain on Friday, all over the area. On Saturday the winds turn light and variable, mostly north and northwest. Maybe puffs of east, in El Paso. It will even be light at the Guadalupes, which usually blow out. On Sunday the winds get stronger, from the west and southwest, approaching blowout conditions in the afternoon. The Guadalupes might be flyable early on. It looks like a blowout by noon, or maybe earlier. Monday looks like a blowout all over the area, from the southwest. Temperatures should be highs in the 50's and low 60's, lows down in the 30s. Recommendations: On Friday, La Luz might work, if it doesn't get soaked. On Saturday, Dry Canyon, being higher, might get winds to launch in, but I expect the road up to be pretty muddy. The Guadalupes might work for paragliders that day, but I think it could be light for hang gliders to stay up. On Sunday, our southwest facing sites should work - if you're ready to fly at sunrise. Expect winds to rapidly increase from the west and southwest, and be sustained overnight. On Monday, it looks like a blowout all over. Best to hide in the bunkers that day. I'm sorry that our annual Presidents Day Weekend gathering at the Guadalupes looks so cursed, but from my perspective it looks like we get only Saturday afternoon and early Sunday as flyable conditions. Call me if you want an update. Good luck, and be safe!